Harriet Bunn Foster, age 77, of Germantown, Wisconsin passed away peacefully January 30, 2019 after a long battle with Multiple Sclerosis. She was born October 14, 1941 in Tampa, Florida to Bud and Bunny Protiva. She married her high school sweetheart, Hensley Foster, in June of 1959. She was the beloved mother of Bunny Bauernfeind (John), Mark Foster (LeeAnn), and Nancy Carr (Steve) and proud grandmother of Joey, Brian (Kelly), Lauryn, David, Marky, Drew, Dylan, and Hattie. Furthermore, she was a cherished sister, aunt, cousin, and friend to many. Harriet lived a full life as a wonderful wife, mother, homemaker, friend, and farm girl at heart. She loved caring for her animals. 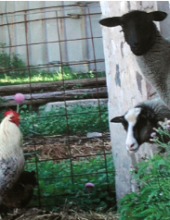 Her favorite place to be was inside her barn tending to her horses, sheep, llamas, and chickens and sharing that experience with everyone she loved and with anyone who visited. Most of all she loved her family and instilled in them a fierce loyalty and love for one another. She will be dearly missed and forever in our hearts. To send flowers or a remembrance gift to the family of Harriet Bunn Foster, please visit our Tribute Store. "Email Address" would like to share the life celebration of Harriet Bunn Foster. Click on the "link" to go to share a favorite memory or leave a condolence message for the family.